k-rated: No More Originality In Hollywood? "What I'd like to do with it is expand on ideas I dreamt up back in the original treatment, that had really expanded on the universe both the Predators and other species live in. 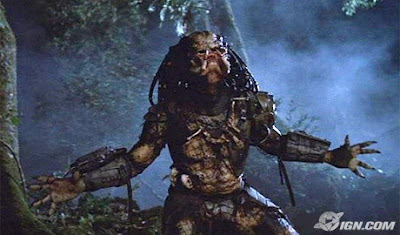 We'd create new otherworldly characters while not taking away from the draw our main Predator has. I think another reason I called it Predators was to mark it as a project that should be taken seriously by a filmmaker to make a worthy follow up to a classic, much in the way Cameron made Aliens a compelling work on its own, following Ridley Scott's Alien." As this project is still in the pre-production who knows what path Rodriguez will venture. I just hope they don't ruin this reboot with a bunch of CGI like George Lucas did with the last 3 Star Wars films. Not only is 20th Century Fox moving forward on the Robert Rodriguez Predator reboot, but it looks as if the rumored Alien reboot is officially moving forward as well. Looks like Fox has hired Carl Rinsch to direct the new Alien film. The only good news is that apparently Ridley Scott is on board to produce. Word has it that this reboot will be more of an origin story as opposed to a straight up remake. The plan is suppose to "stick with the original concept of only one alien on the ship." This isn't confirmed by the studio yet, as it is only an early scoop. My brother David and I were discussing this the other day. While he thinks it's a cool idea to reboot Alien, I maintain it's a really lame idea. I grew up loving both of these movies and feel they need to stay where they are calling it good, because that's what both movies were, GOOD! With these remake/reboots or whatever, they are just going to ruin both franchises. Now I know I defend some remakes (Clash of the Titans), but there are a lot that cause me to vomit in my mouth a little forcing me to brush my teeth for hours on end trying to get the taste out. Needless to say that is how I feel about both of these reboots. While I can complain all day about how there is no more originality in Hollywood I simply won't. What's the point? Hollywood does what they want anyway, hence the Footloose remake. I agree with both you and David-i hate when they go "back to the future" to get ideas but yet there have been some good "reboots" Star Trek, batman, Ok- i can only think of those- but still there have got to be others. So what? I've long embraced the world cinema where originality is in full supply (and more rewarding). Check out the list in Cannes this year, for example. Why limit yourself to Hollywood? Forget all this and lets talk about Megan Foxx. Just saying her name will burn yer tongue. Home Alone 3: The Space Station. Sigourney Weaver and Arnold Schwarzeneger are married and bare the child McCauley Culkin.. then the parents leave their Space Station home. Alien and Predator come to take vengeance on their enemies' child in their absence, ... but little do they know what hilarity and brutality they will receive from the little deviant. (hilarity ensues).